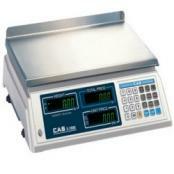 When you think of the CAS Corporation S-2000 digital price computing scale from Central Carolina Scale, you think of features like dual range models that can display weight 0-30 x 0.01 lb / 30-60 x 0.02 lb. You also notice the 999 PLU's and a super bright VFD Display. The scale comes complete with a 14.6 x 10.9 inch Stainless Steel Platter, 1/2 lb and 1/4 lb keys and is NTEP legal for trade.